The Jaguar F-Type IP carrier and airbag chute are both made using Borealis Fibremod™ grades that deliver high processing and end-use performance. Borealis and Borouge, leading providers of innovative, value-creating plastics solutions, have developed important material solutions to address specific challenges faced by the global automotive industry. At the VDI International Congress "Plastics in Automotive Engineering" in Mannheim, Germany taking place on April 2-3, Borealis will highlight an innovative Fibremod™ solution developed for the Jaguar F-Type model in close cooperation with Dräxlmaier, the Tier One supplier. Other important product innovations in surface aesthetics will also be showcased, with focus on tiger stripe-free surfaces, moulded in colour and primerless two-layer paintability. Material solutions offered by Borealis and Borouge help automotive manufacturers achieve defect-free surfaces while at the same time capitalising on the benefits of lower production and system costs as well as reduced environmental impact, by way of overall vehicle weight reduction and optimised cycle times. The Fibremod family of engineered short (SGF) and long glass fibre (LGF) compounds was officially launched in September 2013. Fibremod stands for both the name of a material category as well as the ability of Borealis and Borouge to transform or modify a specific grade to fit and exceed the needs and requirements of its customers. Borealis’ proprietary LGF process technology makes it possible to tailor highly engineered polypropylene (PP) grades in order to meet the unique challenges of individual customer projects. 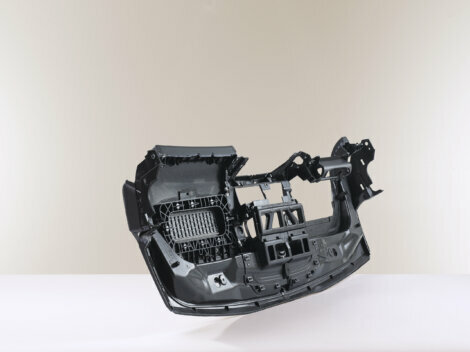 In developing the instrument panel (IP) carrier for its Jaguar F-Type, Jaguar and its Tier One supplier, Dräxlmaier, sought a material solution that would deliver very high stiffness and excellent impact performance, without compromising other key requirements such as dimensional stability. What is more, it was imperative that the materials selected contributed to overall vehicle weight reduction and competitive system costs. "Fibremod innovations support our partners and customers along the entire automotive value chain in their efforts to make vehicles lighter, reduce processing temperatures and energy requirements, all while reducing system costs," explains Jost Eric Laumeyer, Borealis Global Marketing Manager Engineering Applications. "Our customised glass fibre reinforced PP solutions are at the cutting edge of innovation, bringing lightweight, extra strength and impact performance to a wide range of automotive and appliance applications." Borealis and Borouge will highlight their superior surface aesthetics solutions for the automotive industry at the VDI, including updated grades for tiger stripe-free surfaces, moulded-in colour as well as primerless two-layer paintability solutions. "We welcome the opportunity of the VDI to showcase our cutting-edge material solutions, some of which have been developed in close cooperation with partners in the automotive industry," says Harald Hammer, Borealis Vice President Engineering Applications. "Our Fibremod and Daplen™ innovations are excellent examples of how Borealis and Borouge keep discovering ways to deliver new, high-performance and high-quality materials which help achieve enhanced aesthetic appeal." One of the solutions to be highlighted at VDI Mannheim is the upgraded thermoplastic olefin (TPO) Daplen EE250AI, used for instrument panels and other automotive applications to help achieve tiger stripe-free surfaces. Tiger stripes are flow mark issues caused by converting processes which can lead to both exterior and interior surface defects. Through extensive laboratory research and joint testing with partners, Borealis has developed a new PP matrix used in compounds which will help avoid tiger stripes within a very broad processing window. The Daplen EF150HP grade is the ideal successor to one of the first breakthrough moulded in colour solutions for body panels, ED230HP. Moulded in colour solutions make cost reductions possible by eliminating the number of painting cycles required. Borealis will also feature its primerless paintability systems for automotive exterior plastic applications. The company has developed and brought to market grades that boast improved and longer-lasting paint adhesion performance, optimised off-line painting cycle times, and the subsequent lessening of costs and environmental impact. Borealis and Borouge will highlight their Fibremod solutions for the Jaguar F-Type as well as cutting-edge tiger stripe-free grades and other surface aesthetics innovations at the VDI Mannheim in Mannheim, Germany, Stand 54, from April 2-3, 2014. The Jaguar F-Type IP carrier and airbag chute are both made using Borealis Fibremod™ grades that deliver high processing and end-use performance. The Jaguar F-Type IP carrier and airbag chute are both made using Borealis Fibremod™ grades that deliver high processing and end-use performance, while contributing to lower weight and overall system costs.